Our shoes are designed for comfort. Throughout the past 50 years, we have learned to listen to the orthopaedic experts, research institutions and - not least - to what satisfies our customers. We emphasise that our products are of modern design and that orthopaedic footwear can be stylish as well. 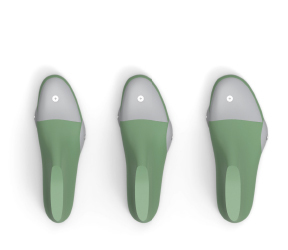 Our special shoes have the additional values that patients and users require, but can hardly be distinguished from high street fashion shoes. If you are experiencing foot pain or discomfort, you should consult a foot care professional who can provide shoe selection guidance and foot orthotics. To determine the need for custom-made foot orthotics, rehabilitation footwear, custom-made or modified footwear, a detailed examination must be executed by trained professionals with the appropriate expertise. FOOTWEAR MODIFICATIONS Footwear plays an important part in the development of toe and foot disorders. In order to improve foot function or to accommodate specific pathologies, footwear may need specific adaptations. We have the know-how and skill to discreetly blend-in these modifications without affecting style. Consult a recognised orthopaedic shoe technician to help you choose the best footwear to suit your foot type or injury. DIABETES For patients that have diabetes and have to deal with the loss of the protective sensation in the foot, proper footwear - with adequate fit, good support in all the right places - is important for preventing or reducing the risk of lower limbs complications. Klaveness Rehabilitation and Medical collections are created to cushion while providing proper support to the body, avoiding painful pressure points. They are designed with few seams, stitching, and rough edges, and are made of soft and smooth linings and uppers, to minimise the exposure to foot trauma caused by footwear. These collections also provide extra room to accommodate custom-made foot orthotics if necessary and can include wide opening to ease the pain of putting on and taking off footwear. THE RHEUMATIC FOOT The foot is a fantastic instrument. A sensitive interaction between bones, joints, and muscles keeps us upright, in movement and in balance. Rheumatic pain and swollen joints disturb this interaction, causing us to place an unnatural strain on our feet. This can subsequently lead to misalignment and repetitive stress injuries in other joints. It is therefore important for persons with rheumatism to practice preventive foot care and wear appropriate footwear at an early stage. ARTHRITIS Arthritis is a progressive and very painful disease, and it can harm and cause pain to the joints in your feet. The pain caused by arthritis is hard to ignore, and can largely interfere with one's day-to-day activities. Wearing the appropriate and well-fitted shoes are crucial to relieving pain and discomfort. 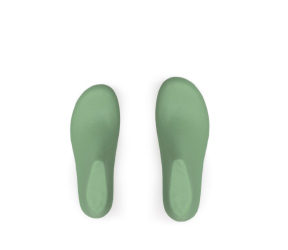 With roomy toe box, seamless stretch material incorporated in the construction of the forefoot part or cushioning foam, Klaveness Medical and Rehabilitation shoes are designed to alleviate pressure, ease pain and maximise mobility for those who suffer from arthritis. Most of our styles are also available in various extra depths so they can comfortably accommodate, when necessary, custom-made foot orthotics. BUNIONS (HALLUX VALGUS) Some of our styles have been designed with the special needs of bunion patients in mind. In this foot condition, the joint at the base of the big toe deviates outwards. Bunions often are associated with the widening of the foot in the ball region. Padded and seamless shoes on the forefoot area can significantly reduce pressure on the ball of the foot. HAMMER AND CLAW TOES To prevent pressure pain, we offer styles made with stretchable material in the toe region, and free from seams against which the foot could rub, thereby reducing pressure and enhancing wearing comfort. ODD SIZED SHOES If you have two different sized feet, Klaveness can provide an odd sized pair - a pair of shoes in the same model but in different sizes. Talk to your clinician about this possibility. FEET MEASUREMENT :: Your feet size can change throughout your life time and one foot may be larger than the other. A knowledgeable shoe fitter should measure both of your feet to choose adequate fitting footwear. FOOT LENGTH :: Measure the length of the feet by standing up with full pressure on both feet. It’s important to get the measure from the most prominent point in the back of the heel to the longest toe. SHOE AND FOOT SHAPE MATCH :: For a shoe to fit perfectly, the shape of your foot must match the shape of your shoe. COMFORT :: Proper fitting footwear should feel comfortable the moment you try it on. TOE WIGGLE ROOM :: Your toes need wiggle room to avoid getting blisters, calluses or damaged toenails. A minimum of 5mm of space should exist between the longest toe of your largest foot and the shoe. PROPER HEEL FIT :: Footwear should fit around your heels. Place your index finger between the shoe’s heel and your heel. For proper fit, you should be able to slide your finger between them. 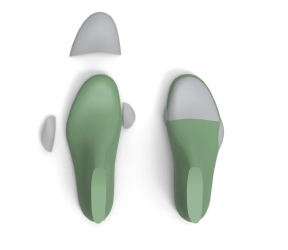 REMOVABLE FOOTBEDS :: Prefer footwear with removable footbeds. Footbeds play an important role to create comfortable shoes, as they provide moisture management and can be replaced when they wear out. 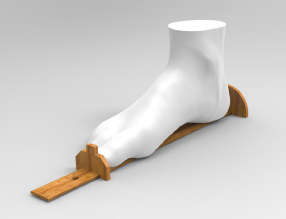 If you need custom-made foot orthotics you must require footwear with a removable footbed to accommodate it.